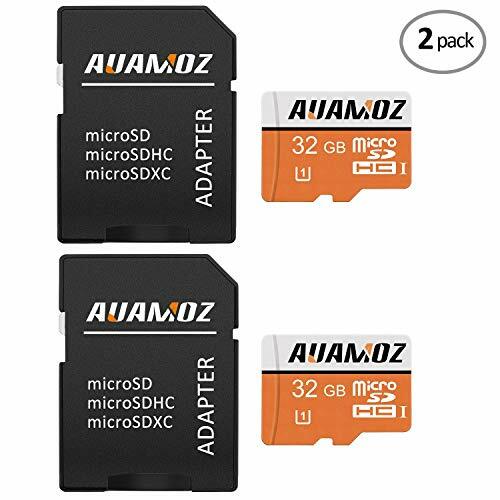 AUAMOZ's micro SD Card has added memory capacity and multi-device afunctionality so you can focus on life,not technology.this UHS-I Speed Class1(U1) and Class 10 compatibility card is perfect for capturing photos and for video recording & playback in full HD.And with read & write speeds of up to 80MB/s & 20MB/s respectively,apps and videos load quicker and files transfer faster. *To reach the maximum read/write speed, a UHS-I enabled and USB 3.0 reader or host device would be recommended. Get the most out of the latest smartphones,tablets,and cameras.This memory card works perfectly with even the most advanced devices to protect your memories for life. Capture the moments that matter. with the AUAMOZ micro SD Card. You can shoot as many rich and detailed full HD videos as you want on your smartphone, tablet, or camera,confident that each memory will safe.Play your videos back on your full HD TV or monitor and relive the experience as vivdly as the day it happened. Even if you are doing outdoor activities in some extreme climate conditions, the series can still survive from water, shock and wide-temperatures storage ranging from -40ºC to 85ºC! Moreover, the series is immune to airport X-rays so there is no need to worry when travelling overseas. Micro sd card (2 Pack) up to 80MB/s & 20MB/s read & write speeds respectively; Class 10 UHS-1. High compatibility for different types of devices including smartphones, Android Tablets, Tablet PCs, Action Cameras, DSLRs and more. TF card includes: Full-Size adapter for use in Cameras and Laptop/Desktop Computers. Water proof, temperature proof, shock proof, X-ray proof and magnet proof. If you have any questions about this product by AUAMOZ, contact us by completing and submitting the form below. If you are looking for a specif part number, please include it with your message.